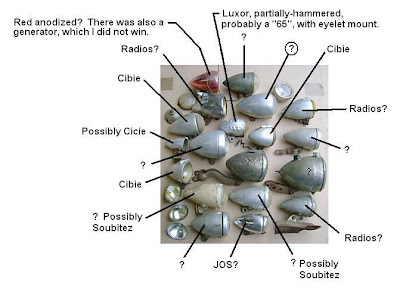 This assortment of headlights is on it's way from France. Just guessing at the manufacturers until I can get a better look. There's a Luxor partially-hammered (middle), and what I think is ar JOS (bottom row center). The larger light above the Luxor and Cibie (marked with a ? in a circle) has a lovely shape... I'm anxious to see what kind it is.